Southern California's largest earthquake since 1952, M 7.5 on 28 June, appeared to trigger seismicity at several volcanic centers in California. It was centered roughly 200 km E of Los Angeles. In the following, David Hill describes post-earthquake activity at Long Valley caldera, and Stephen Walter discusses the USGS's seismic network, and the changes it detected at Lassen, Shasta, Medicine Lake, and the Geysers. In recent years, the USGS northern California seismic network has relied upon Real-Time Processors (RTPs) to detect, record, and locate earthquakes. However, a film recorder (develocorder) collects data from 18 stations in volcanic areas, primarily to detect long-period earthquakes missed by RTPs. The film recorders proved useful in counting the post-M 7.5 earthquakes, most of which were too small to trigger the RTPs. The film record was scanned for the 24 hours after the M 7.5 earthquake, noting the average coda duration for each identified event. Some events may have been missed because of seismogram saturation by the M 7.5 earthquake. Marked increases in microseismicity were observed at Lassen Peak, Medicine Lake caldera, and the Geysers (table 1). 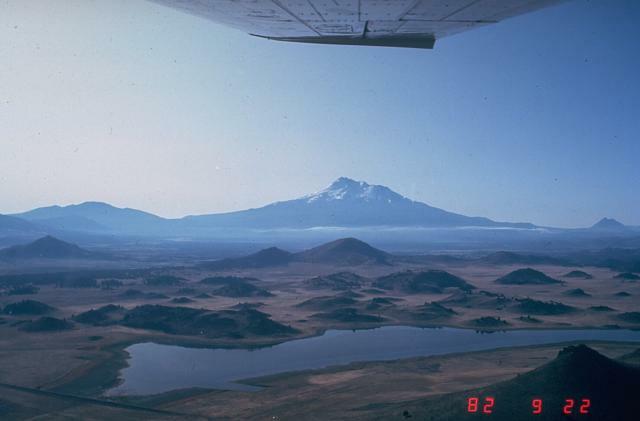 No earthquakes were observed at Shasta, but the lack of operating stations on the volcano limited the capability to observe small events. Table 1. Number of earthquakes at northern California volcanic centers during 24-hour periods following major earthquakes on 25 April (40.37°N, 124.32°W; M 7.0) and 28 June (34.18°N, 116.47°W; M 7.5) 1992. Events with coda durations less than or equal to 10 seconds and greater than 10 seconds are tallied separately. Earthquakes were identified from film records of seismograms from nearby stations. Courtesy of Stephen Walter. Film was also scanned for the 24 hours following the M 7.0 earthquake at 40.37°N, 124.32°W (near Cape Mendocino) on 25 April. Although smaller than the 28 June earthquake, its epicenter was only 20-25% as far from the volcanoes. Furthermore, both the 25 April main shock and a M 6.5 aftershock were felt at the volcanic centers, but no felt reports were received from these areas after the 28 June earthquake. Only the Geysers showed any possible triggered events after the 25 April shock. However, background seismicity at the Geysers is higher than at the other centers, and is influenced by fluid injection and withdrawal associated with intensive geothermal development. Shasta report.The film record showed no earthquake activity beneath Shasta (~900 km NNW of the epicenter), although telemetry problems limited the ability to detect events below M 2. Of the six earthquakes in the 24 hours following the M 7.5 shock, two were large enough to be recorded by the RTP system. These were centered about 60 km SE of Shasta and about equidistant from Lassen (figure 1). Because the arrival times and S-P sequences of the other four events were similar to those of the two located shocks, it is likely that all had similar epicenters. Occasional M 2 earthquakes have previously occurred in this area, which includes several mapped N-trending normal faults with Quaternary movement. Three days after the M 7.5 earthquake, a M 2.0 shock occurred beneath Shasta's SE flank, followed by a M 2.7 event the next day. Both were centered at about 15 km depth, similar to most earthquakes beneath Shasta in the last decade. Figure 1. Seismic events in the Shasta/Medicine Lake area that were apparently triggered by the M 7.5 southern California earthquake of 28 June 1992 (circles) compared to 1978-90 seismicity in the region (crosses). Squares mark seismic stations. Courtesy of Stephen Walter. Information Contacts: Stephen Walter and David Hill, MS 977, U.S. Geological Survey, 345 Middlefield Road, Menlo Park, California 94025 USA. The Global Volcanism Program has no Weekly Reports available for Shasta. An earthquake swarm in the vicinity of Mt. Shasta began at 0202 on 1 August. The first event, M 4.2, was followed by six M 3-4 events in the next 45 minutes. Between 35 and 40 shocks (M greater than or equal to 2) were recorded on 1 August. The number of events declined slightly the next day and only about ten had been recorded by midday on 3 August. About 20 of the total had M greater than or equal to 3. Permanent seismographs were too distant for precise hypocenter determinations, but USGS personnel were bringing portable seismographs into the area. An ash eruption, probably from Shasta, was sighted from a ship off the California coast in 1786. Information Contacts: R. Lester, USGS, Menlo Park, CA. The number of earthquakes declined to only a few events per day (M greater than or equal to 2) by 11 August. However, on 12 August a M 4.3-4.5 shock was followed by several similar events (approximately M 4), and others in the M 3.5-4 range occurred on the 13th. Activity then declined again; on 23 August only 13 events of M 2-2.5 were recorded, and by the end of August only about six events greater than M 2 were being recorded daily. Epicenters have been located along about 2 km of a pre-existing N-S-trending fault zone 28 km E of the summit. Uncertain crustal velocities for the area have made depth determinations difficult, but all events have been shallow, probably less than 5 km, and some may have been less that 1 km deep. No migration of events has been observed. New tensional fissures have been found in the epicentral area, but were not growing as of late August. Leveling, microearthquake studies, and gravity profiles are planned. Information Contacts: R. Sherburne, California Division of Mines & Geology; A. Walter, USGS, Menlo Park, CA. Seismic activity E of Mt. Shasta had declined by late September to about six locatable events per day, most stronger than M 2. Hypocenters extended E from surface fissures 28 km E of Shasta, along a pre-existing N-S-trending fault zone. Focal depths were very shallow near the surface fissures, but increased to 4-6 km along an inclined seismic zone dipping 35-45° E. The events have not been migrating, nor has there been any evidence of volcanic activity associated with the swarm. Further Reference. Bennett, J.H., et al., 1979, Stephens Pass earthquakes, Mount Shasta—August 1978; California Geology, February, 1979, p. 27-33. Information Contacts: R. Sherburne, California Division of Mines & Geology. The most voluminous of the Cascade volcanoes, northern California's Mount Shasta is a massive compound stratovolcano composed of at least four main edifices constructed over a period of at least 590,000 years. 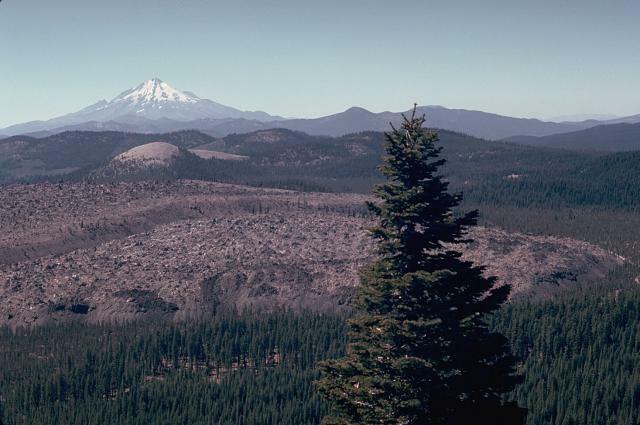 An ancestral Shasta volcano was destroyed by one of Earth's largest known Quaternary subaerial debris avalanches, which filled the Shasta River valley NW of the volcano. 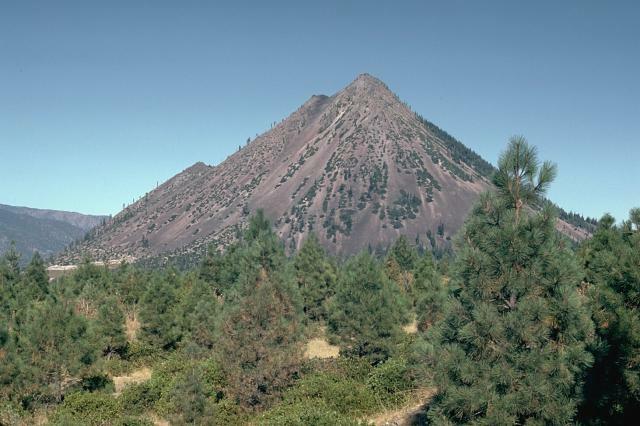 The Hotlum cone, forming the present summit, and the Shastina lava dome complex were constructed during the early Holocene, as was the SW flank Black Butte lava dome. Eruptions from these vents have produced pyroclastic flows and mudflows that affected areas as far as 20 km from the summit. Eruptions from Hotlum cone continued throughout the Holocene. Christiansen R L, Miller C D, 1976. Volcanic evolution of Mt. Shasta, California (abs). Geol Soc Amer Abs Prog, 8: 360-361. Coombs H A, Howard A D, 1960. United States of America. Catalog of Active Volcanoes of the World and Solfatara Fields, Rome: IAVCEI, 9: 1-68. Crandell D R, Miller C D, Glicken H X, Christiansen R L, Newhall C G, 1984. Catastrophic debris avalanche from ancestral Mount Shasta volcano, California. Geology, 12: 143-146. Hildreth W E, 2007. Quaternary magmatism in the Cascades--geologic perpectives. U S Geol Surv Prof Pap, 1744: 1-125. Miller C D, 1980. Potential hazards from future eruptions in the vicinity of Mount Shasta volcano, northern California. U S Geol Surv Bull, 1503: 1-43. Sherrod D R, Smith J G, 1990. Quaternary extrusion rates of the Cascade Range, northwestern United States and southern British Columbia. J. Geophys. Res, 95: 19,465-19,474. Ui T, Glicken H, 1986. Internal structural variations in a debris-avalanche deposit from ancestral Mount Shasta, California, USA. Bull Volcanol, 48: 189-194. There is no Deformation History data available for Shasta. There is no Emissions History data available for Shasta. These hills below the north flank of Mount Shasta are part of the massive Shasta Valley debris-avalanche deposit, formed during the Pleistocene by a major volcanic landslide from Mount Shasta. Individual hills, composed of remnants of an ancestral Shasta volcano, are up to 200 m high and range to more than 1 km in length. Photo by Lee Siebert, 1981 (Smithsonian Institution). Mount Shasta, California's highest volcano, dominates the landscape of northern California, forming a prominent backdrop to the Little Glass Mountain obsidian flow from Medicine Lake volcano in the foreground. Steep-sided Black Buttes lava dome on the lower SW flank of Mount Shasta, was formed during the early Holocene at the same time as the formation of Shastina lava dome on the upper west flank. Pyroclastic flows accompanying growth the Black Buttes traveled up to 11 km to the south. The notches on the western flank (left) mark the tops of several individual domes of the composite Black Buttes lava dome. 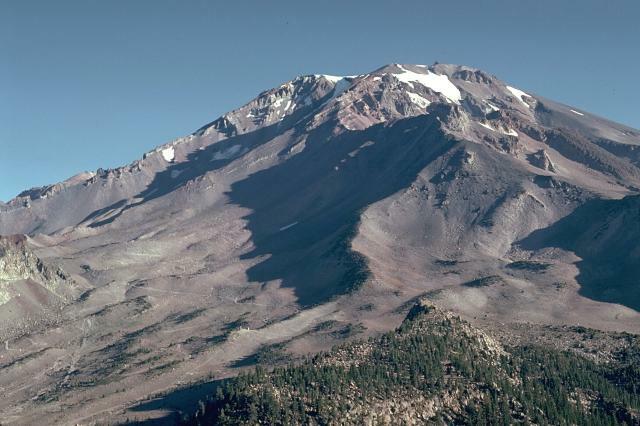 The extensively eroded Sargents Ridge (right center), on the south side of Mount Shasta, is the oldest of four major edifices that were constructed following the collapse of ancestral Mount Shasta. The Sargents Ridge cone formed during the Pleistocene, less than 250,000 years ago. Mount Misery, which forms much of the upper part of the cone and overlies the Sargents Ridge cone, formed less than 130,000 years ago. 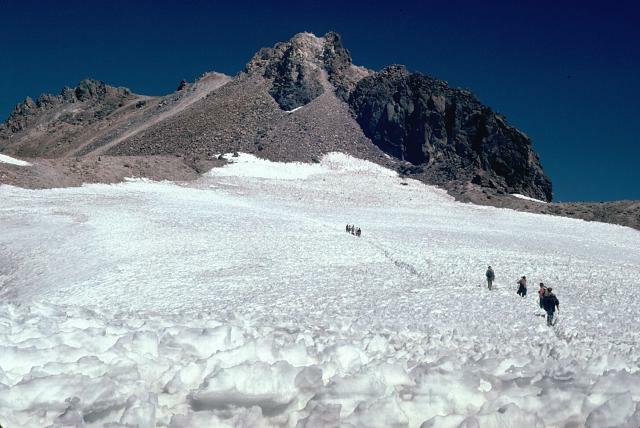 Shastina lava dome on the west flank of Mount Shasta, with Whitney Glacier at its base, is one of the most prominent Holocene features of Mount Shasta. Its summit contains several overlapping plug domes. Emplacement of Shastina about 9500 yerars ago was accompanied by pyroclastic flows and lava flows that traveled long distances down its flanks. Photo by Bill Chadwick, 1981 (U.S. Geological Survey). 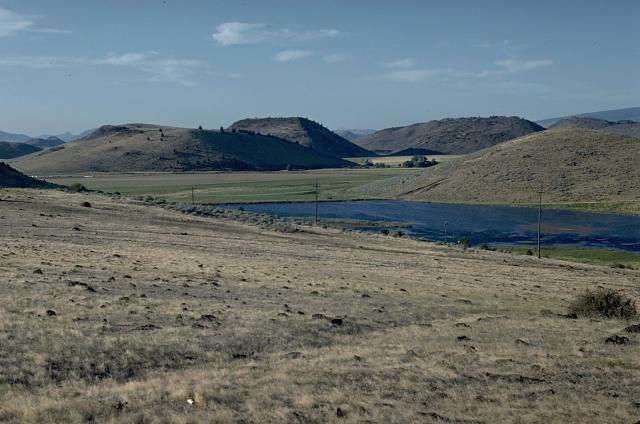 The foreground hills are part of the Shasta Valley debris-avalanche deposit produced by one of the largest known Quaternary volcanic landslides. Roughly 46 cu km of an ancestral Mount Shasta collapsed about 350,000 year ago, producing a massive debris avalanche that swept some 50 km to the north, filling the broad Shasta Valley with hummocky debris. Photo by Dave Wieprecht, 1995 (U.S. Geological Survey). 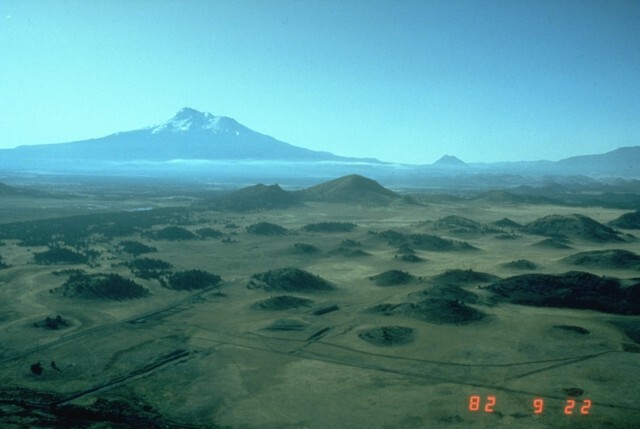 The prominent lava dome of Shastina, seen here on the right from the north, was formed on the west flank of Shasta between about 9500 and 9230 years ago. The summit of Shastina contains several overlapping plug domes. 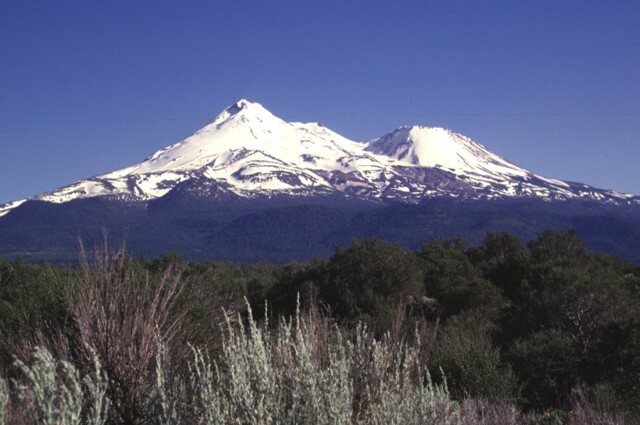 Hotlum cone (left), which forms the summit of Mount Shasta, may overlap Shastina in age, but is mostly younger. Photo by Dan Dzurisin, 1982 (U.S. Geological Survey). 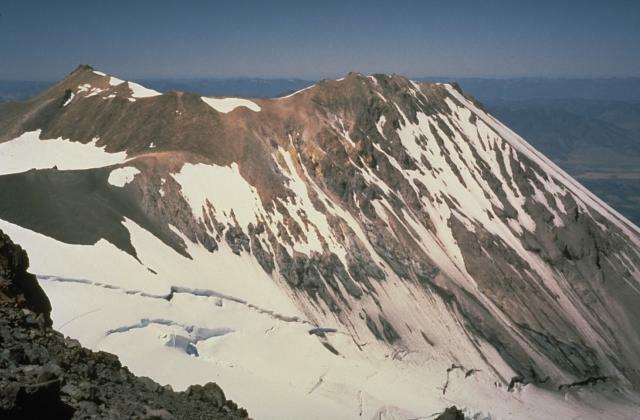 Hotlum cone, seen from the NW, forms the 4317-m high point of Mount Shasta, second in height only to Mount Rainier among Cascade volcanoes. Hotlum, one of the latest constructs on a volcano composed of several overlapping edifices, was formed during the Holocene. 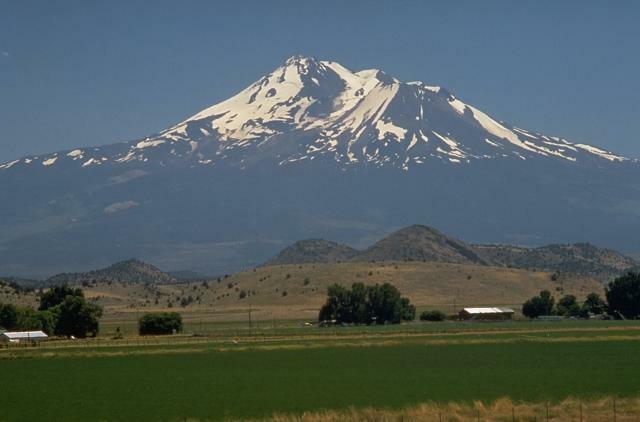 Mount Shasta in northern California, seen here from the SE, is the largest of the Cascade stratovolcanoes and is constructed of at least four overlapping volcanoes. 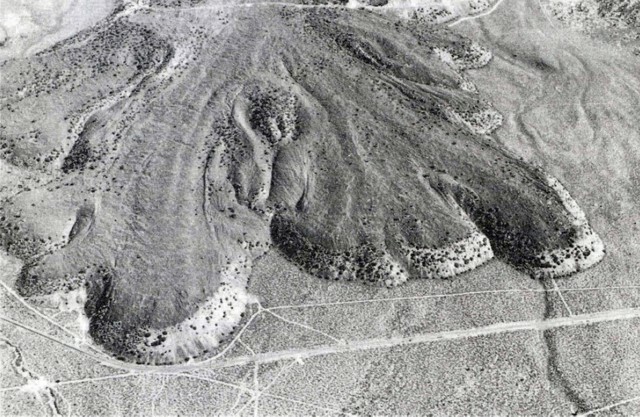 Hotlum cone, which marks the summit, and the flank Shastina and Black Buttes lava domes were formed during the Holocene. 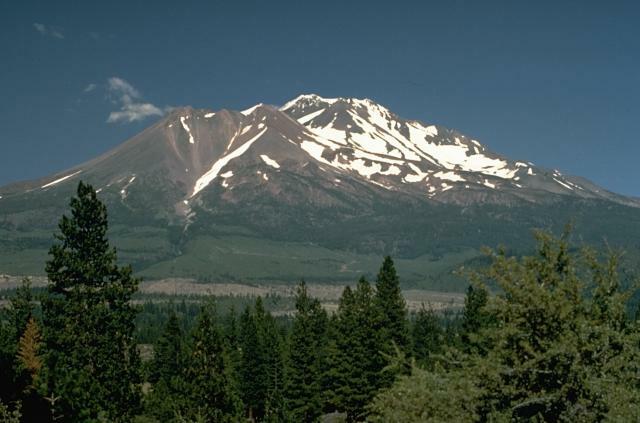 Mount Shasta has been frequently active throughout the Holocene. The only historical eruption of Shasta was observed from off the coast of California by the French explorer La Perouse in 1786. Photo by Lyn Topinka, 1984 (U.S. Geological Survey). Shastina lava dome forms the largely snow-free ridge to the left of the summit of Mount Shasta. During the growth of Shastina in the early Holocene, andesitic lava flows traveled up to 14 km, and pyroclastic flows swept down its flanks, covering much of the areas that are now the sites of the towns of Weed and Mt. Shasta. A roadcut exposes the internal structure of the Shasta Valley debris-avalanche deposit, formed by collapse of Mount Shasta during the Pleistocene. 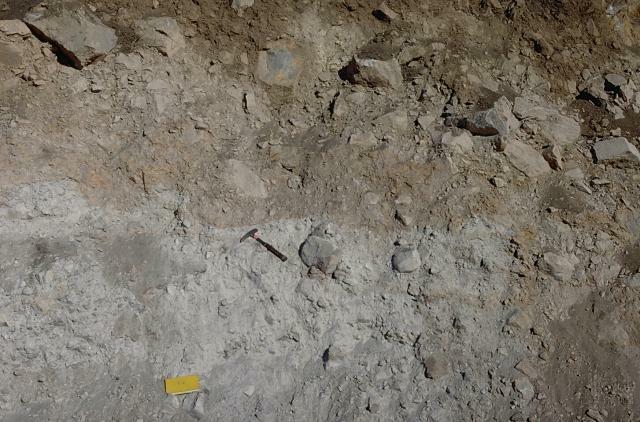 The deposit contains angular blocks of Mount Shasta rocks surround by crushed matrix of similar material, in sharp contact with blocks and matrix of differing lithologies. The hilly topography in the foreground is part of the massive debris-avalanche deposit produced by collapse of Mount Shasta (center horizon). The roughly 46 cu km, highly mobile debris avalanche swept some 50 km to the north. The hummocky area represents relatively intact segments of the volcano that were carried within a more fluid mixed facies of the avalanche. Individual hummocks range up to a few hundred m in height and roughly 1 km in length. Photo by Harry Glicken, 1982 (U.S. Geological Survey). 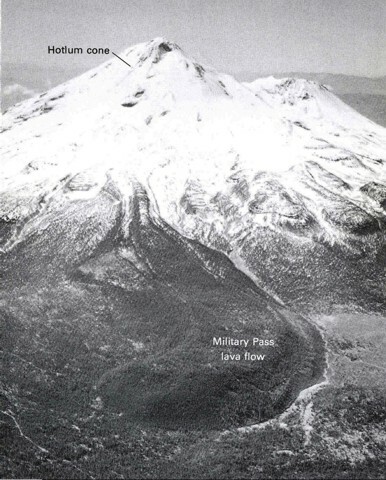 Hotlum cone, which marks the 4317-m-high summit of Mount Shasta, was formed during the early Holocene, and has been active frequently since. A small depression in the summit dome that contains an active hot spring and groups of fumaroles may have resulted from the last eruption of Shasta in 1786. 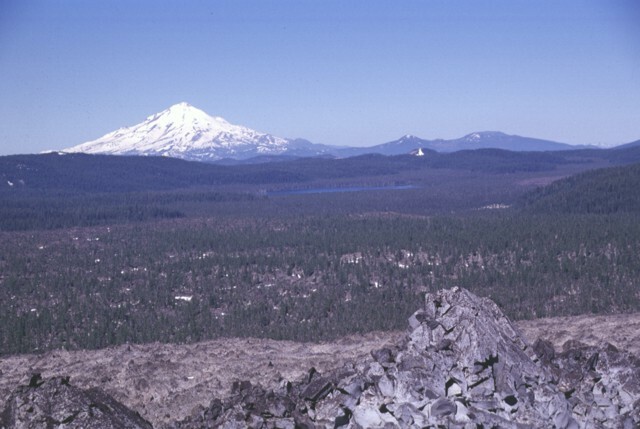 The Little Glass Mountain obsidian flow, seen from Little Mount Hoffman on the west rim of Medicine Lake caldera with Mount Shasta in the background, was erupted on the SW flank of Medicine Lake volcano a little more than 1000 years ago. 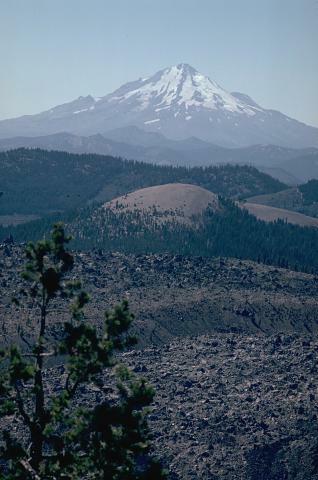 The light-colored rounded peak in line with Mount Shasta is Pumice Stone Mountain, which is overlain by pumice from the Little Glass Mountain eruption. A series of smaller flows to the NE known as the Crater Glass Flows were erupted at about the same time. 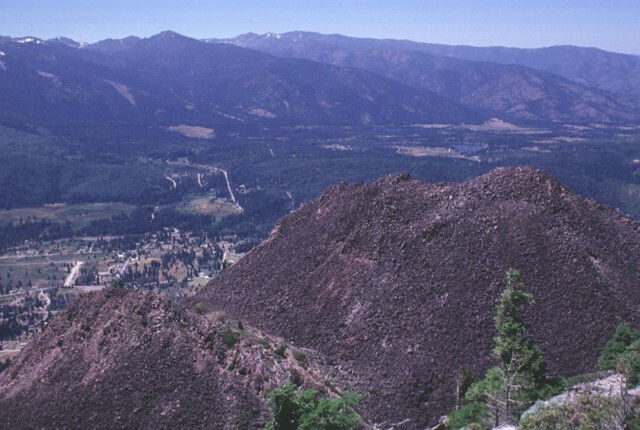 The hilly topography in the foreground is part of the massive debris-avalanche deposit produced by collapse of Mount Shasta (left horizon) during the Pleistocene. The hummocky area represents relatively intact segments of the volcano that were carried within a more fluid facies of the avalanche. The larger hills in the center of this image are older volcanic rocks surrounded by the avalanche deposit, although elsewhere individual hummocks range up to a few hundred m in height and roughly 1 km in length. Four overlapping dacitic domes form the Black Buttes lava dome on the lower western flank of Mount Shasta. This view looks NW from the summit of Black Buttes at the rubbly tops of two domes with the outskirts of the town of Weed below. Pyroclastic flows accompanying formation of Black Buttes extend 10 km south and 5 km north, and underlie currently populated areas. 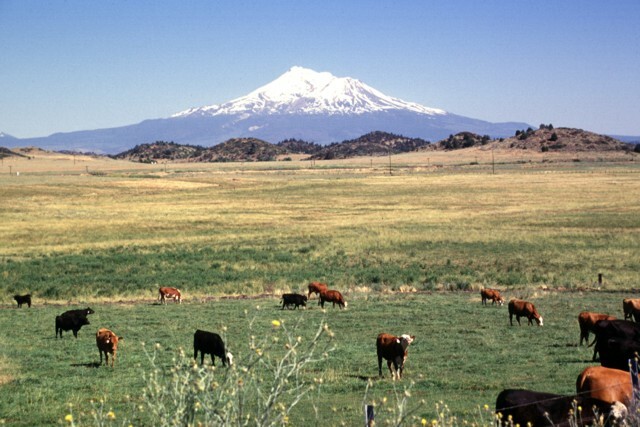 The forested hills and rolling pasture lands near the town of Montague are part of a massive debris-avalanche deposit that originated from Mount Shasta during the Pleistocene. The hills consist of remnants of the former edifice of Mount Shasta that were transported relatively intact to this point, about 40 km NW of the volcano, in the largest known Quaternary avalanche from a continental volcano. 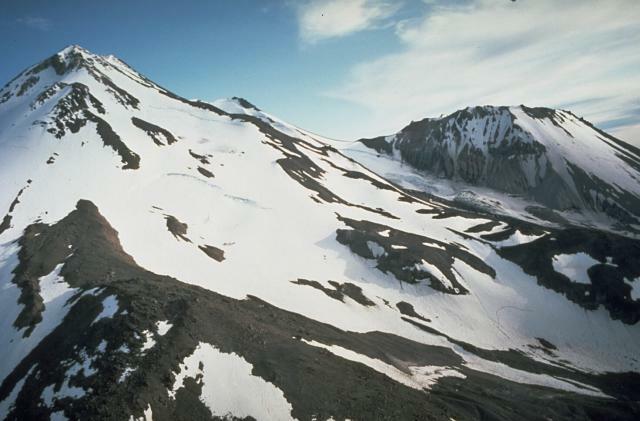 The origin of the hills remained enigmatic until volcanologists noticed the resemblance to the avalanche deposit produced at Mount St. Helens in 1980. Massive Mount Shasta, the largest-volume volcano of the Cascade Range, rises 3500 m above the landscape of northern California. It is seen here from the north, with Holtum cone forming the 4317 m summit and Shastina lava dome on the western flank. The compound volcano is composed of at least four main edifices, of which the last two, Hotlum and Shastina, are of Holocene age. Shasta's only historical eruption was observed from the ship of the explorer La Perouse off the California coast in 1786. The broad partially forested lava flow extending across the center of the photo into Medicine Lake caldera is the Hoffman lava flow, erupted about 1230 years ago. The massive rhyolitic lava flow and an adjacent smaller one were erupted from six or more vents on the NE rim of the caldera. The larger of the two flows, seen here with the unvegetated Glass Mountain flow in the foreground, was erupted near the caldera rim and flowed both west into the caldera and down the east flank. Snow-capped Mount Shasta rises to the west. An aerial view shows the Military Pass lava flow on NE side of Mount Shasta, the longest lava flow known from the volcano, erupted about 9200 years ago. 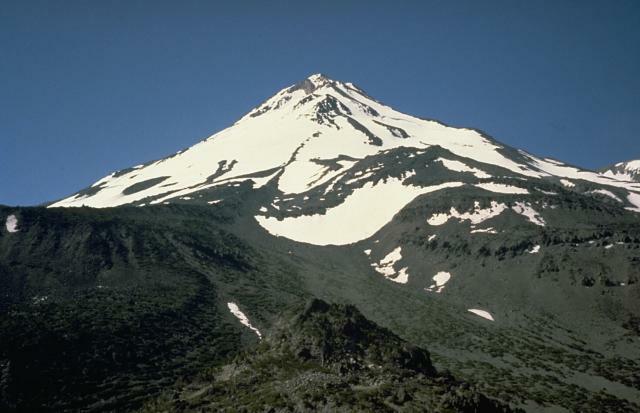 The blocky lava flow originated near the summit of the Hotlum cone and flowed 3-3.5 km down the steep flanks of the cone before reaching gentler slopes on the volcano's flanks. The flow is about 9 km long and about 150 m thick near its snout. The flow overlies the Red Banks pumice and a broad fan of pyroclastic-flow deposits that were formed shortly before about 9700 years ago. Photo by Dan Miller, 1980 (U.S. Geological Survey). An aerial view shows the terminous of the Lava Park lava flow, erupted from a vent on the flank of Shastina lava dome on the NW flank of Mount Shasta about 9300 years ago. The blocky basaltic-andesite flow is about 6 km long and 110 m thick at its snout. The lava flow overlies a wide apron of pyroclastic-flow deposits erupted from Mount Shasta about 9700 years ago. The area shown is about 2000 m wide. The broad line crossing the photo near the bottom is Highway 97. The following 16 samples associated with this volcano can be found in the Smithsonian's NMNH Department of Mineral Sciences collections, and may be availble for research (contact the Rock and Ore Collections Manager). Catalog number links will open a window with more information. 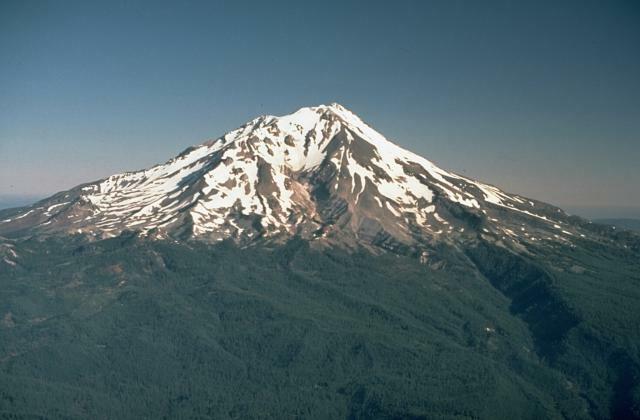 Large Eruptions of Shasta Information about large Quaternary eruptions (VEI >= 4) is cataloged in the Large Magnitude Explosive Volcanic Eruptions (LaMEVE) database of the Volcano Global Risk Identification and Analysis Project (VOGRIPA).